Today, we’re proud to announce that The National Bank of Abu Dhabi (NBAD) has become the first bank in the Middle East to use Ripple’s solution to provide real-time cross-border payments to its customers. Through Ripple, NBAD customers have an efficient, secure and reliable channel to make immediate international remittances and payments between regional markets. Applied to NBAD’s already innovative remittance infrastructure, the Ripple solution offers customers end-to-end visibility of transactions and allow for the instant transfer of funds to a beneficiary in a cost-effective manner. The issue of security was a significant one to this particular partnership. We are seeing a global shift in how financial institutions approach the protection of their data. NBAD’s introduction of Ripple to the region represents a crucial step forward in the protection of customer information and transactions by eliminating the requirement of using intermediary banks for transfers, and operates in parallel to the SWIFT system. 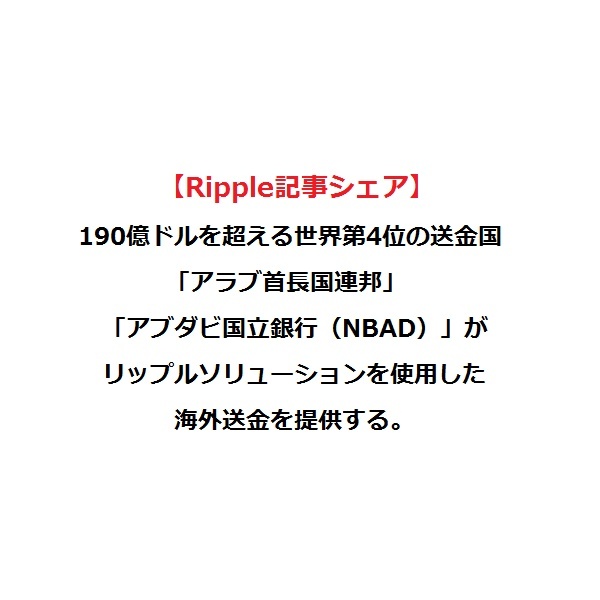 Although NBAD is the first bank in its region to serve its customers using Ripple’s technology, the bank joins a growing list of financial institutions around the world to do so, including Santander, Standard Chartered, and UniCredit. Copyright © 2019 マネタイズ.net. All Rights Reserved.